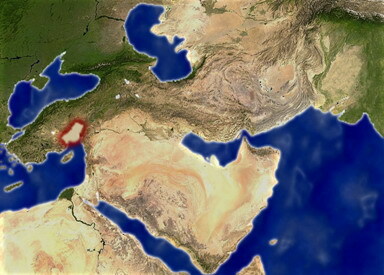 When Armenia was overrun by Byzantines and Turks in 1064, many Armenians fled to the safe haven of Cilicia, which at the time was ruled by the Armenian warlord Philaretos Brachemios. Among these Armenian refugees was Prince Rhoupen and his son Gosdantin. Together they established a new Armenian state in Cilicia, quickly ousting the local Byzantine armies. Over the decades, the Byzantines and Turks desperately tried to wipe out this "New Armenia", but to no avail. With Armenian victories at the decisive battles of Mamistra and Marash, Armenian security was assured for the next two centuries it survived in Cilicia.Armenia has also had many confrontations with the Crusader states, mostly Antioch. However, the Antiochan threat was neutralized long ago with the crushing Armenian victory at Iskenderun. Armenia then joined forces with the Crusaders and siezed Cyprus from the Byzantines. However, Armenia would soon regret that and the plains of Cilicia were conquered by John II Comnenus. Armenia rebounded from these setbacks, however, and rose again to become a great military and economic power. In 1174, Armenia is recovering from the rule of the Muslim prince Mleh and is now under the rightful rule of the Christian Armenian Rhoupen III. Mleh now sits powerless in the fortress of Vahka, cowering behind its massive walls. Now is the chance to turn Armenia from a shadow of its former self and reclaim the glory of the Armenian Empire of old. These brave azat soldiers are armed with sword and shield, trained and prepared to sacrifice all that is needed to defend their honour and glory. Horse javelineers, light in armor but very experienced in the throw of javelin. They are usually the first to engage the enemies of ERE. Javelin throwing skirmishers, who should be recalled once they unleash their javelins at the enemy. Light spearmen, called to arms in the defence of Armenia. Lightly armoured, offensive infantry, these men should not be counted on to hold a battle line. Fierce men from the mountains, these soldiers fight with bows. Medium Infantry armed with Javelins and swords, good on the offensive or defensive. Superior to their light brothers in every way, these spearmen are rugged and firm in stance. Men from Armenia, superbly skilled in the art of the bow. Light horse, used as both horse archers, and as mellee cavalry. Medium armoured dismounted cavalry armed with traditional javelins, able to pierce armour and wreak havoc among enemy lines. Elite noble dismounted cavalry, armed with fierce maces able to negate armour with their blunt force. Medium armoured cavalry armed with traditional javelins, able to pierce armour and wreak havoc among enemy lines. Semi-Professional Crossbowmen, weak in the face of incoming archery, but able to truly shine when supported by spearmen. Light-Medium Horse Archers, better armored than their tribal turkoman kin, but of weaker moral. The heavy cavalry bodyguard of the Armenian Takavors, the elite of the army, they will prevail, or die. Superior to their mountaineer axemen brothers in every way, these swordsmen are rugged and firm in stance. Weak soldiers armed with spears, protected by a shield and some amour. Heavier than light spearmen, but still levies. Armed with spears to stab down cavalry. Archers with poor crossbows, but familiar with their skill. Poor morale. Archers with a sturdy bow that can harass infantry, but get slaughtered by cavalry. Horse Archer mercenaries skilled with bow and short sword. Mounted archers are vital for combating the more maneuverable armies of the east. These are brutal troops who carry out their work with finesse and swiftness. In the constant political and military conflict in Anatolia these make good support troops. Skilled and hardy archers. A good mix of infantry, missile and cavalry. Lack of early lancers and a dangerously precarious position.